1. Cut two same-sized circles out of felt. 2. Cut the letter out of felt. I just looked at the font on my computer and drew out a match, but you could also print it out and create a stencil. Whatever is easiest for you. 3. Hot glue to one of the circles. You could also run this through the sewing machine, which I would have done if I kept my machine readily available. 4. Hot glue ribbon or yarn to the inside of the back circle. Not the circle you just glued the letter to. 5. Using a blanket stitch, sew all the way around the circle until the stitch is connected. A blanket stitch is pretty simple, but sometimes mine still looks a little funky. Here is a really bland, yet helpful, youtube video on the blanket stitch. 6. Hang on tree and admire. I love how simple and graphic they are. I plan on making a set for our friends as a hostess gift! As I've said in previous posts, I am very into Christmas this year. 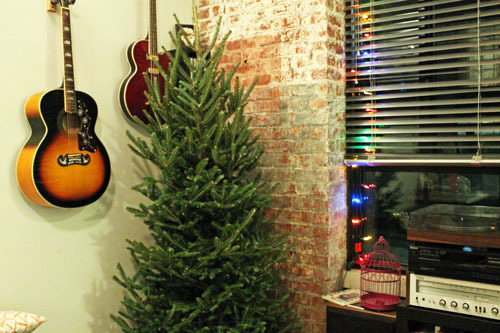 And I knew that I wanted to have a Christmas tree because it would be T and I's first Christmas living together. We knew it would be a bit of a challenge to get a skinnier tree that was actually taller than me (all the skinny ones are like 5'5" and I didn't want to be taller than our tree), but it only took three places to find one that would work for us. It's pretty cute, with it's imperfections, but it fits great in the space and doesn't overcrowd the room. I'm always worried about that for some reason. We played Christmas music, I drank hot cider, we laughed. All in all, a great night.